Do Your Gums Bleed During and After Brushing? Periodontics focuses on the inflammatory disease that damages the gums and other supporting structures around the teeth. Dr. McOmie is an expert in the latest techniques for the prevention, diagnosis, and treatment of periodontal disease and the placing of dental implants. We treat cases ranging from mild gingivitis to more severe periodontitis. We offer a wide variety of treatments, such as root planing and scaling (cleaning the infected root exteriors), root surface debridement (the removal of damaged tissue), and regenerative procedures (the reversal of lost bone and tissue) and surgical procedures for patients with severe gum disease. Additionally, Dr. McOmie is well trained in the installation, maintenance, and repair of dental implants. During the early stage of gingivitis, bacteria in plaque build up, causing the gums to become irritated and inflamed and will bleed during normal tooth brushing. Although the gums may be irritated, the teeth are still solidly planted in their sockets. No irreversible bone or tissue damage is present. When gingivitis is left untreated, it can advance to periodontitis and ultimately to tooth loss. 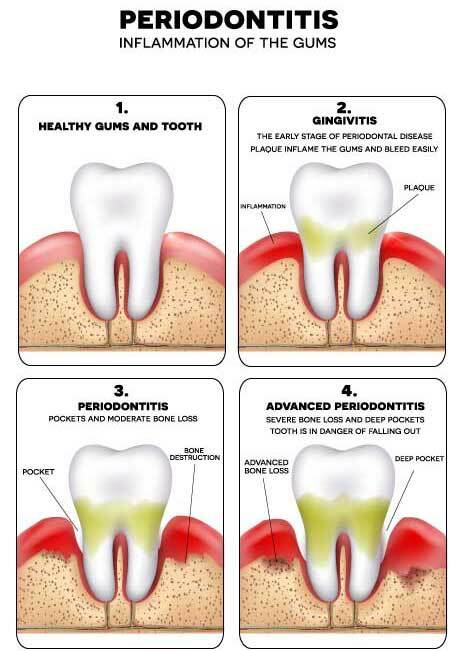 Periodontitis causes the inner layer of the gum and bone to pull away from the teeth and form periodontal pockets. When debris gets trapped in the spaces between teeth and gums, it can cause infection. The body’s immune system tries to fight off the bacteria as the plaque spreads and grows below the gum line. Dr. McOmie will examine the gums, check to see if there is any gum line recession, evaluate how the teeth fit together when biting, and checks for any loose teeth. We also take a small measuring instrument called a probe and place it between the teeth and gums to determine the depth of those spaces, known as periodontal pockets; this helps to assess the health of your gums. We may also take X-rays to view the health of the bone below the gum line. Even if symptoms are not present, you may still have some degree of gum disease. Sometimes gum disease may affect only certain teeth, such as the molars. Dr. McOmie can recognize and determine the progression of gum disease and recommend the proper treatment.